Golf over Independence Day weekend is an American tradition for many families. In honor of our national birthday, we’ve done some digging on what golf course has the most patriotic name. Some courses are named after U.S Presidents, particularly golfing presidents like Dwight D. Eisenhower. Others take it a step further. In Las Vegas, Revere Golf Club pays tribute to Paul Revere's midnight ride with the Lexington Course and Concord Course. 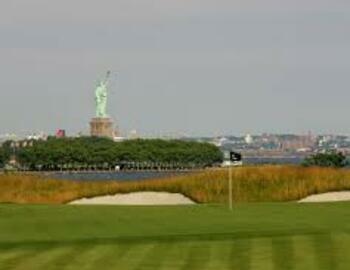 No golf course may have a more patriotic setting than exclusive Liberty National, which sits in the shadow of the Statue of Liberty.